Our team picked up this courtesy of the team at MEMRI earlier this morning as we received this at our Virtual Studios. Dr. Zibakalam, who serves as a Professor at the University of Tehran, is one of the most prominent dissidents and has been extremely vocal in speaking out against the policies of the Islamic Republic. What he underscores here is what is shared by a majority of Iranians that must be underscored as the rapprochement with the West has continued under the current President, Hassan Rouhani--it is quite telling and in our view, took courage by him to be as vocal as he was--A true courageous "ordinary face"
Prominent Iranian dissident and Tehran University professor Sadegh Zibalakam, who in 2014 was sentenced to 18 months in prison for criticizing the regime's nuclear policy and for his reformist and pro-U.S. opinions, is a prominent voice in the conflict in Iran between the ideological camp and the pragmatic camp. MEMRI has published many translations of his statements. The following are two recent MEMRI TV clips of Zibakalam's statements. On November 5, 2016, footage was posted online showing Zibakalam refusing to step on the American and Israeli flags and pushing away students who were trying to force him to do so. 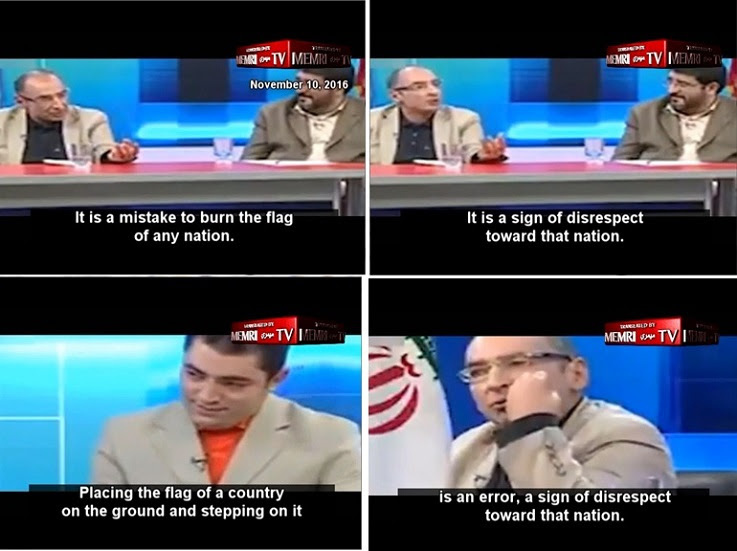 Prof. Zibakalam later explained on a television show, on November 10, that stepping on the flag of any nation was a sign of disrespect toward that nation. The footage of the incidents and the interview were posted on Zibakalam's Facebook page in November. Zibakalam said in the interview: "It is a mistake to burn the flag of any nation. It is a sign of disrespect toward that nation. Placing the flag of a country on the ground and stepping on it is an error, a sign of disrespect toward that nation. You do this kind of thing, and then some London-based [Iranian] complains that when traveling to the US, he was thoroughly checked at the airport. Even his eyes were scanned. This is an act of disrespect." In an interview conducted by the Iranian Ministry of Islamic Culture, Zibakalam criticized the Iranian regime over its stance on Israel, saying that by promoting calls for the destruction of Israel, Iran was acting in violation of the U.N. Charter. He further criticized Iranian Supreme Leader Ali Khamenei's idea of a referendum on the future of Israel, saying that it was unrealistic and, furthermore, none of Iran's business, and pointing out that Iran's commitment to destroy Israel was evident in its parading of long-range missiles with slogans in Hebrew pronouncing that "Israel must be destroyed." The interview was posted on the ministry's official YouTube account on November 13, 2016. Zibakalam: "The UN officially recognized Israel, and Iran is a member state. According to Article 1 of the UN charter, the UN member states must not conduct acts of aggression against one another, and must not wish death and destruction upon another nation. "What Palestinian political movement calls for the destruction of Israel?" Interviewer: "The Islamic Jihad and Hamas..."
Zibakalam: "Absolutely not. Hamas calls for a Palestinian state. Where does it call for Israel's destruction? "Most of the Palestinians who became refugees in 1948, almost 70 years ago, are already dead, and some of them emigrated to Jordan, Armenia, or Ethiopia. There are already second- and third-generation (Palestinians) there. Are you really suggesting holding a referendum to determine if they should return to Palestine or not? How would they even identify them? "Let's say that a referendum is held tomorrow, and the Jews return to where they lived 70 years ago, and the Palestinians return to where they lived 70 years ago... Let's assume that this were possible." Interviewer: "Are you saying that we shouldn't care about this?" Zibakalam: "No that's not what I'm saying. 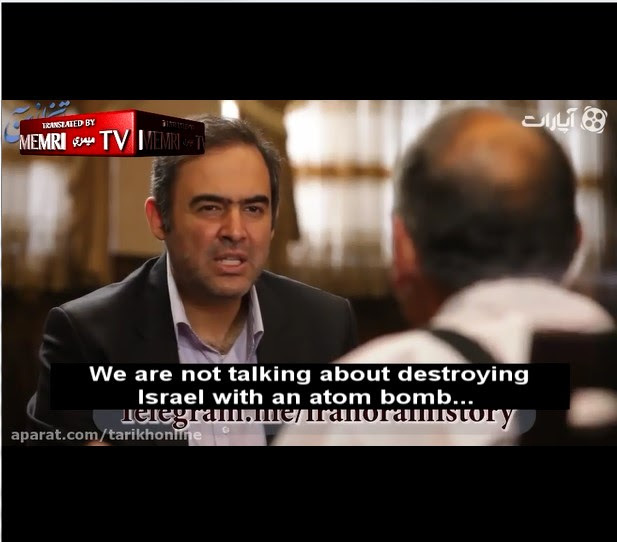 I'm talking about Iran's mission to destroy Israel, and about our declarations that we must destroy Israel..."
Interviewer: "We are not talking about destroying Israel with an atom bomb..."
"They know that if they ask me, I will comply in full – so what's the point in arresting me? After the [demonstrations of] September 18, 2009, they called me, and said: 'Mr. Zibakalam'... That was when the [Farsi] BBC was launched. 'Don't talk to the BBC anymore," they said. I said: 'Fine.' They called and said: 'Mr. Zibakalam, don't talk to Radio Farda.' I said: 'Fine.' Another telephone call: 'Don't talk to VOA. I said: 'Fine.' Why should we arrest him if he complies every time we tell him what to do?" ion? Was there a poll in which the Iranian people said that Israel must be destroyed? Does Islam say this? Who said that we must destroy Israel?! "There is a practical reason why they do not arrest me. They say to themselves: Why arrest him? We can just call him and tell him to shut up, and he won't utter another word.